Safe, simple and fun child friendly plastic aquarium set. Features easy feed canopy, Marina filter, Nutrafin cycle and Aqua Plus water treatments, static cling decals and a themed surfer wave plastic cut out. Capacity: 14 litres/3.7 US gallons. 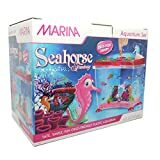 Safe, simple and fun child friendly plastic aquarium set. Features easy feed canopy, Marina filter, Nutrafin cycle and Aqua Plus water treatments, static cling decals and a themed surfer wave plastic cut out. Capacity: 14 litres/3.7 US gallons. Features easy feed canopy, Marina filter, Nutrafin cycle and Aqua Plus water treatments, static cling decals and a themed seahorse coral décor plastic cut out. 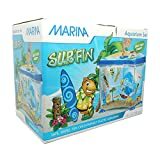 Safe, simple and fun child friendly plastic aquarium set. Features easy feed canopy, Marina filter, Nutrafin cycle and Aqua Plus water treatments, static cling decals and a themed seahorse coral décor plastic cut out. Capacity: 14 litres/3.7 US gallons.